Starting at the beginning of March 2013, I walked for five weeks along the GR1 Sendero Histórico. Apart from the weather, apparently the worst in Spain since 1947, I had a great month, - the GR1 is an amazing walk and deserves to be much better known internationally. The GR1 is a 1,200 kilometre trail running across northern Spain from the Mediterranean to the Asturias. 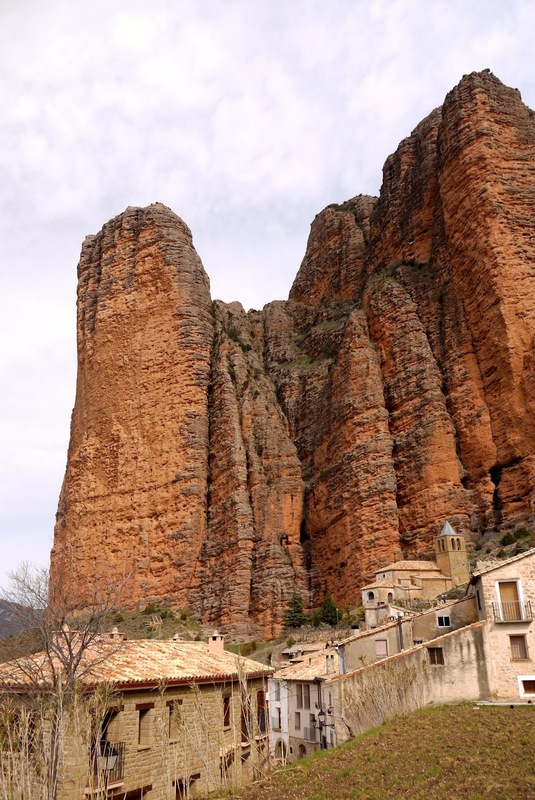 As the name suggests, the route has a historical theme and was developed to take the walker along the boundary between Moorish and Christian Spain. 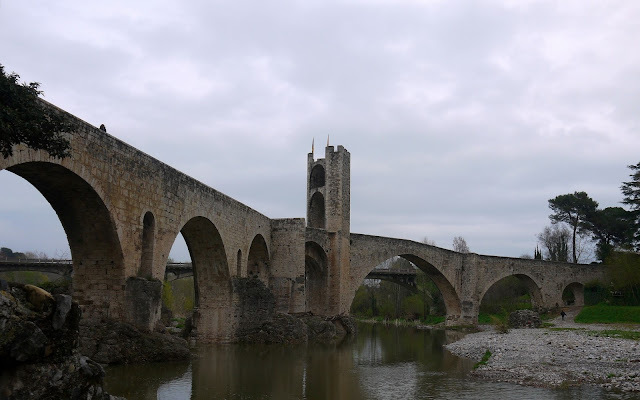 Travelling along it, I visited some of the world's most important Romanesque sites (Sos del Rey Católico, Loare Castle, Besalú). 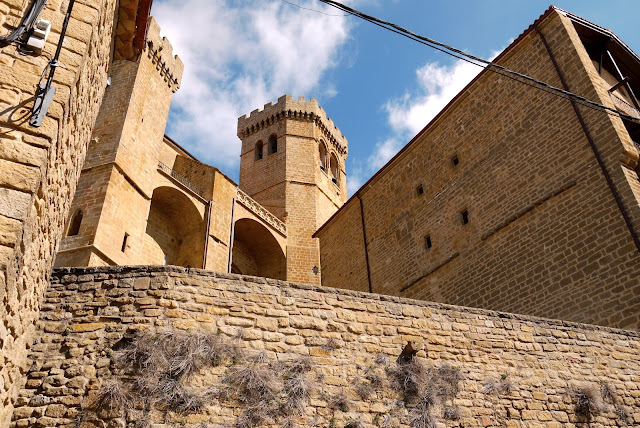 The sites along would make the route attractive to anyone with just the slightest interest in medieval history, but it also provides lots more. It passes through spectacular unspoilt landscapes. 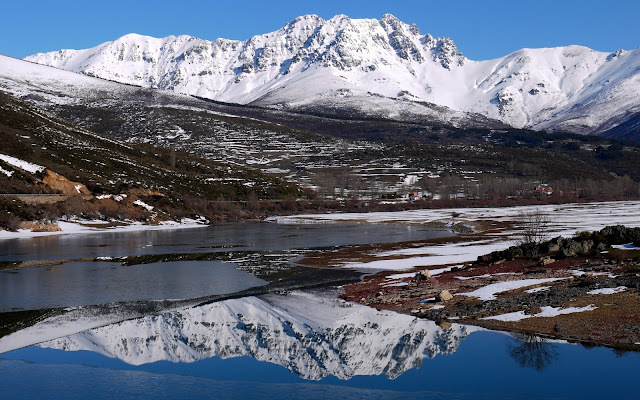 The Cantabrian Mountain in the west and the Pyrenean foothills in the east are best described as "sub-Alpine" - similar to the Vercors or the Jura. 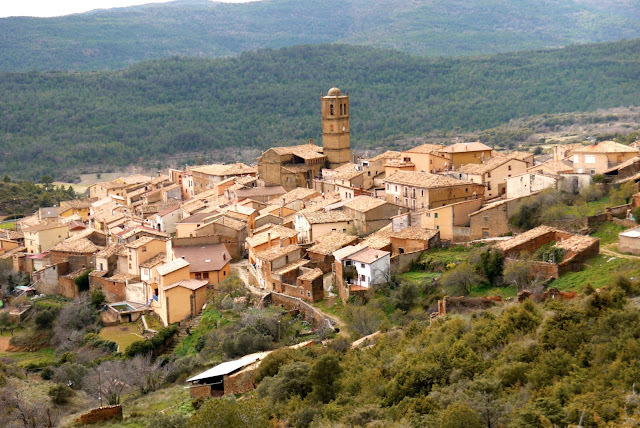 In the middle - for 150 kilometres or so - there is a flatter section, where the route takes you across Navarre and classic Spanish plateau countryside. Perhaps the most memorable feature of the landscape is the huge red cliffs which you see in various places, on the approach to the Pyrenees in particular. Some of these cliffs, typically adorned with a church or the ruins of a castle, exceed 400 metres in height. Compared to walks at similar altitudes in other parts of Europe, most of it is "tree lite", in particular there are hardly any of the commercial pine forests so common in France, Italy and Austria. Instead of looking at identical trees all day long you actually get to see something. The relatively limited amount of commercial forestry is partly a consequence, I think, of the fact that most of the upland countryside, until quite recently, was used for agriculture. The evidence of a more densely populated past is everywhere, particularly Aragon where the empty villages and even towns are almost "post-apocalyptic". I'm old, but not that old, and I find it incredible to think that the emptying of these towns and villages took place in my lifetime. The trail itself is, in large parts, a product of this more populated past. For a 1,200 kilometre route, there is very little road walking. Much of the route follows tracks used over centuries to link village to village. 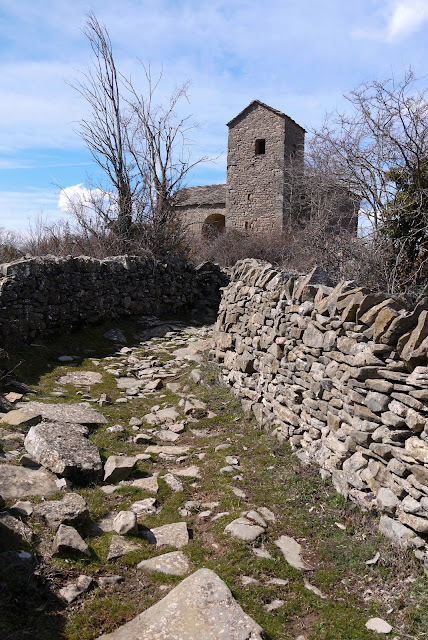 On the best parts, the original paving and dry stone walls are intact and ware and tare inflicted by ancient footfalls can still be seen. The route also takes you through landscapes rich in wildlife, often with specially protected status. You are unlikely to see a bear (although you do walk through a reserve) or one of the wolves which are gradually being reintroduced, but you can easily encounter a wild boar. You would be very unlucky not to see one of the many species of deer or ibex that live along the route, especially in the Cantabrian mountains. 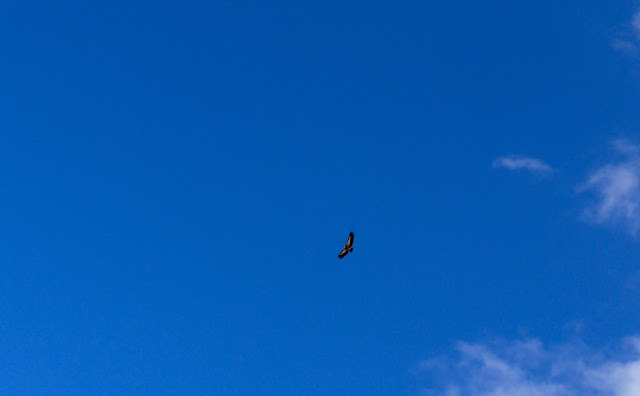 What you will definitely see is amazing birdlife: storks, cranes, eagles and in particular huge griffon vultures, whose numbers have increased significantly in recent years. 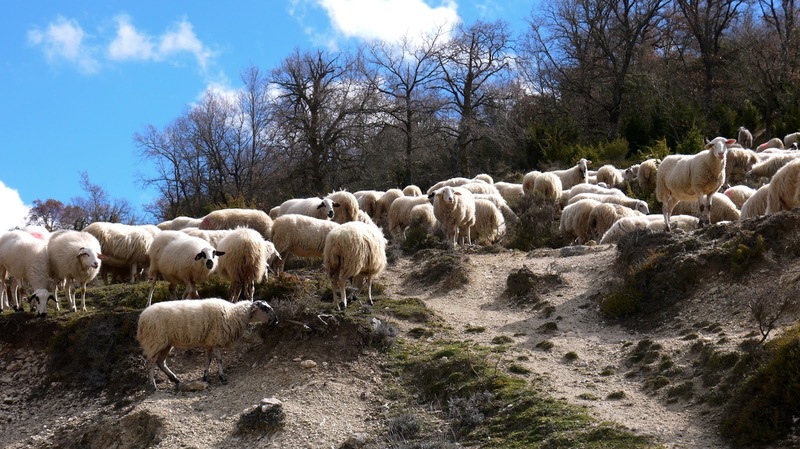 Generally speaking the GR1 is easy walking and apart from one tiny stretch just before the descent to Avià, you definitely don't need a head for heights. I tried to fit in as much as possible, though had to scale my ambition down towards the end and make more use of taxis to shorten the walks than I would have liked. Generally speaking, there is accommodation on or close to the trail at feasible day hike intervals. The GR1 has all the attractions of a great walk. It uniquely combines historical interest with great scenery and rich wildlife. You are also walking in Spain which has many good points as well as a few niggles. Spain is a great early season, late season destination. Despite the fact that I managed to choose what was supposed to be the worst March, weather-wise, in Spain since 1947, from the perspective of an Englishman abroad it wasn't that bad. I had 37 wet days and three seriously wet days, including one day when I decided not to walk. This year I would have been better off going a couple of weeks later, it would have been greener and the trails would not have been so wet or in some cases full of snow. Normally though, March, April and May and September/October are the best months for walking. On the niggle side you have to live with the fact that waymarking varies from region to region, that the route changes over time and that it is not defined in a consistent way on the map base. I navigated using a GPS trail that I downloaded from Juan Holgado's website and a digital map base which I bought when I walked the E4 via the Complegps website - although you can now get them bundled up with lots of types of GPS software. Juan's trail is not 100 per cent "the GR1" because sometimes it changed since he walked it and sometimes he chose to go a different way but it will definitely get you where you want to go. I've now got my own GPS trail, part Juan, part waymarks on the ground and when I get round to it will publish a cleaned up version. A tiny niggle, but one which will strike some people new to walking in Spain, is that there are a lot of dogs. In rural Spain, houses are typically surrounded by a high fence and inside the fence are one or a number of dogs. These dogs bark, what is initially a little intimidating soon becomes just mildly annoying. Surprisingly, dogs not constrained by a rope, chain or fence, don't bark as much as those that are and if anything are timid creatures. In over 100 days of walking in Spain, I never seriously felt threatened by the dogs although I do find that walking poles provide an occasional but necessary bit of assurance. So my current nomination for the best long distance walk in Europe is the GR1 Sendero Histórico. It's got the perfect combination of stunning countryside scattered with great hilltop towns, fortified hamlets, Moorish lookout towers and isolated little churches, wonderful wildlife, interesting quirky accommodation, great food, great value and, if you're just a bit luckier than me, fabulous weather. If you want to read a daily account of my trip of along the GR1 then please go to the following links. Good choice! All of the route is accessible in April and April/May is perhaps the best time to. If I only had a week, I would either do Day 14 to Day 19 or Day 18 to Day 25. My guide will be out in 3/4 months and that will provide a more accessible schedule than the one I walked. Hi Annick, nice to hear from you. In December you expect snow in the mountains, at the western and eastern ends, elsewhere it will be cold and wet. You can wild camp, it's so isolated along much of the route it's not a bad option. By the way my guide to the route can now be pre-ordered on Amazon. I have been enjoying your blog for some time - enjoy the trip reports as well as the humorous subtext (Christine's guest blog and hotel rules still amongst my favorites). I have purchased in PDF your GR1 book. My wife and I are planning a ten day walk May 2016 and I will do the full walk in 2017. The guide will certainly help. Thanks for leading the way. Happy travels, Nathan. Hi Nathan - Thanks for you kind comment - I've had a great response to the guide so far and I'm sure you'll enjoy the walk. May I think is the perfect month to go so have a great trip. Hey John.I'm thinking mid January to February hiking some of the GR1. I'm a experienced hiker in winter conditions an would wild camp along the route.Is it fairly easy to resupply in the remote villages along the way? Thanks!! Hi Joe - it does depend a little on which stage of the walk you intend to do but yes by and large there are small towns/villages along the route with places to buy food. It is remote countryside though and it will be cold in January February. 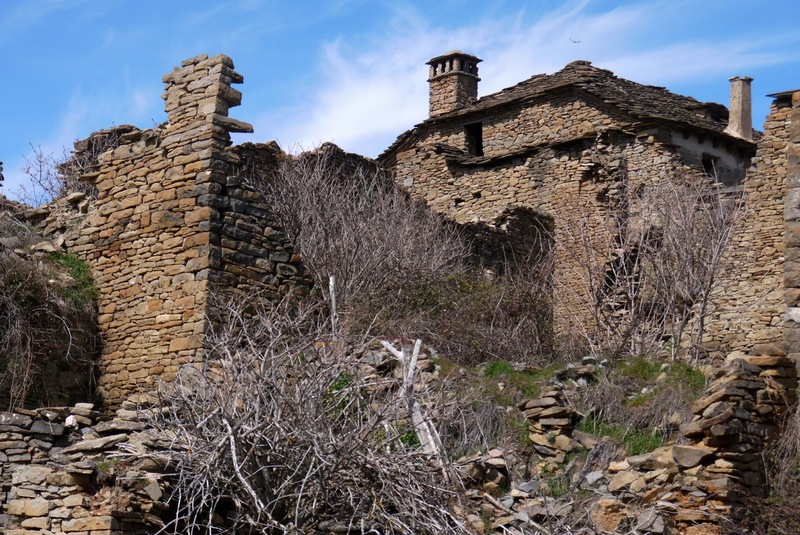 The Guide book 'The GR1: Spain's Sendero Histórico' is now out and it details all the villages with shops. Have a great trip. 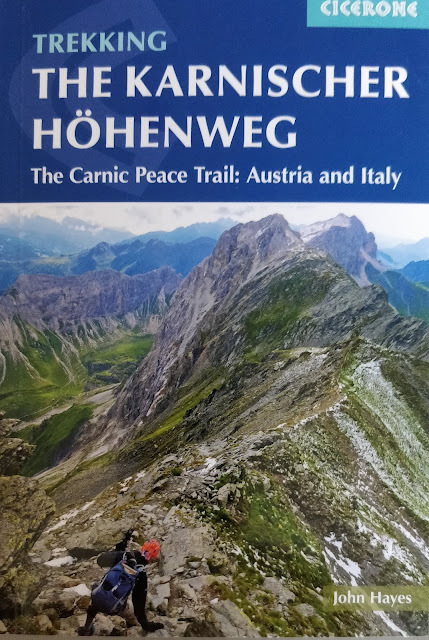 We're planning for walking the GR1 late April to June. We've purchased your book and are finding it very valuable and informative. Thanks a lot for writing it! You suggest gear weight of 7kg - that sounds like no tent and cooking equipment. But what about sleeping bag, emergency tarp/groundsheet? I'm struggling to get much below 8kg. Advice appreciated. The itinerary assumes that walkers will be staying in local accommodation. I don't carry any emergency sleeping gear so that's not included in the suggested allowance. Bedding is provided although in one place, Biel, if you stay in the hostal you might need a sheet sleeping bag. I do know campers who get pretty close to the 7kilo target so for non campers it shouldn't be a problem. I hit 6 with a camera and other electrics. If you want to carry some camping gear than have a look at http://www.backpackinglight.co.uk for some recommendations. Best of luck with your trip and let me know how you get on. I have read your posts with interest since I walked from York to Rome with my wife in 2012. Last year I walked the length of the Loire from mouth to source and I'm just about to set off on an adventure from Granada to Santiago. I am sure I came across a reference somewhere in your blog about your choice of shoe and would be interested to know whether you still favour the same thing as I am on the brink of abandoning walking boots! That's right I abandoned boots for all but the coldest wettest walks before I walked to Budapest. I wear Inov8 Roclites, very light and very comfortable, a choice I share with lots of other long distance hikers. Sounds like you've to done some great trips. Hi John - We’re very pleased to have bought a copy of your new guide. Thank you for all your detailed exploratory work on the ground ! We’ve always walked off paper maps before, but are trying to modernise by going more digital. I’ve downloaded Viewranger, but can’t find the GR1 listed on their site. Am I somehow looking in the wrong place for this ? Any advice much appreciated. One final query : when walking in Italy, we found that in reality most places only took cash. Do the Spanish GR1 hotels and restaurants take Credit Cards, or will we need to load up with plenty of euros ? Thanks for buying my book. You will definitely find life a lot easier with Viewranger but please practice a bit before you go. The GPX files can be downloaded from Cicerone or Viewranger. I have organised them into sections the first one of which is http://my.viewranger.com/route/details/Njg4Mzg=. If that doesn't work come back to me. Spain is similar to the UK in terms of credit cards and all commercial places accept them. If you're staying in a casa rural expect to have to pay cash. Compared to the UK the ATM density is very high and you'll them in the smallest of town so getting cash is generally not a problem. Thanks vey much John. I've now got to the link on Viewranger so we're all set. Thanks too for your advice on ATMs &c.
Only a week or so before we get on the GR1. We've booked accommodation for the first week or so after Campo de Caso but are hoping we can book on spec after that. Can you help on two related questions: do you have any ideas of numbers of GR1 walkers starting out this season? And secondly, what sort of general tourist pressure is there in May and June, in other words how likely is it that hotels, etc will be full? Booking.com often gives the impression that hotels are pretty booked up, at least in the Picos area. Glad to hear that you're walking the GR1, I'm sure you will have a great time. I'm afraid I can't give you numbers but I would be surprised if the hotels are full. Hopefully there are more people this year because of the guide but not enough to fill the hotels. You're right booking.com often gives the impression that the hotel is full but I find there is no relation between their availability and actual availability. The only time I've struggled with accommodation are bank holidays, particularly Easter, and occasionally weekends. Casa rurals also are not always open and of course can be booked by a whole party. With these caveats I wouldn't worry. Excellent news. 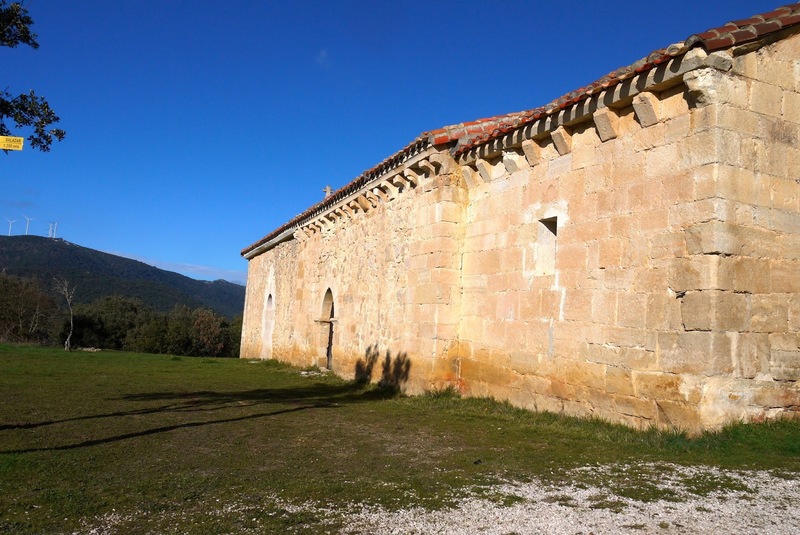 I had the impression, but no hard evidence, that the Casa Rurales in some places e.g. Bezanes (Raphael's place),may be seasonal and not necessarily open in winter/early spring. I could get no reply from them, so ended up booking in Campo de Caso. We really appreciate your prompt responses and support. You're right about the casa rurales, particularly if you try and book ahead. They will often open up however if you turn up, go into a local bar and ask. Bit nerve wracking though if you relying on it! Why not start at the beginning and walk to Reinosa. From Reinosa catch the bus to Bilbao (nice place), another bus to Pamplona and another bus to Olite. It's not as difficult as it sounds. From Olite you can walk to the coast. We're getting along well. 38 days done and about 14 to go. It's just great. From snow in Cantabria to heat and thunder in Catalonia. Stunning scenery, and a wonderful variety of accommodation. The guide has been our bible Back Country Navigator on Android has got us out of a few scrapes. Enjoying a beer at Cal Petit Hotel right now. Will send some track updates when we get back home to NZ. So pleased to hear it's gone well. The Cal Petit does great food but just a bit off the track. You've still got some great walking to do and some more very interesting places to stay. The day after tomorrow is a bit of a nuisance I'm afraid! We did it and we're back in NZ. Along the way we made some notes on the Guide about changed GR1 routes, etc. My email is robmccoll@outlook.com. If you wish to contact me by email we could discuss how I could make our notes available to you or Cicerone. Some are edits to your text, some are route changes, others are about accomm. and sevices along the way. ive just come back from canterbury to rome..the via francigena. Which guide book do you suggest for the gr1? Sounds like a great trip. You can get my guidebook on the GR1 from Cicerone. Thanks for inspiring me to have a go at the GR1 rather than the Camino de Santiago! I aim to walk in September and early October. I am new to walking so would be interested in your thoughts about the weather (i.e. not too cold or wet!) and availability of accommodation. Fascinated by this trail. Is there an update coming soon? Thanks for all this really useful information. I'm thinking of walking and wild camping the Aragon part of the GR1, especially the Sierra de Guara, in early to mid April next year. Obviously the weather is variable but what kind of night time temperatures might you expect at that time of year? It could be cool at night. Spring doesn't come any earlier in most of Spain than it does in the UK because its generally higher. A really nice couple who go by the name of "wildprilgrims" walked the whole route from east to west a couple of years ago and started in March. They were wild camping and did a brilliant blog (reassuringly they also had a great time) so would be good people to contact about temperature and wild camping on the GR1. If you search wild pilgrims you'll find their blog and drop them a note. Have a great trip and send me some pictures. I have tried them but haven't got a response yet. I may try their installation account. What were day and night temperatures like when you walked in March? I'm sure they'll come back to you eventually. The weather was good, warm in the daytime, between 15 and 20 degrees I guess. I didn't camp but all over Spain, on the meseta, anything above 600m, it will be cold at night, around freezing in March. I wasn't camping but frost on the ground was common.